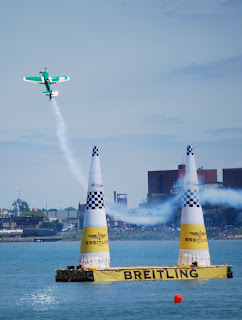 Red Bull Air Races – Detroit – Sunday – USA’s Chambliss Wins! Subscribe to Airspeed through iTunes or your favorite other podcatcher. Or listen online right here by clicking: http://media.libsyn.com/media/airspeed/AirspeedRedBull1.mp3. It’s all free! Check out the link above to hear the episode that Rod Rakic and I recorded early this afternoon before the racing started. A little hangar flying there at the media center on the Detroit riverfront. Couldn’t have asked for a better setup. Full catering and all the Red Bull we could drink. You guys know me. I’m a full-time lawyer, writer, aviation nut, etc. who tries to do all that a proper 21st century renaissance man should do. I owe it all to caffeinated beverages. Put me in a full media center with high-speed (1Gb) Internet, access to a great photo vantage point, and all the Red Bull I can drink? By noon, I couldn’t feel my face. Everyone was walking around in slow motion. Yeah, baby! 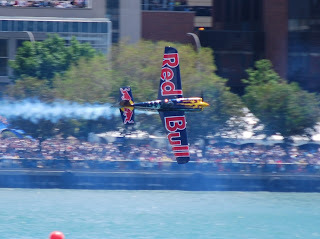 American Kirby Chambliss, flying the No. 4 Red Bull-sponsored Edge 540 took the series leader Paul Bonhomme with a time of 1:12.08, just 0.15 seconds ahead of Bonhomme. Bonhomme remains the points leader for the series and both flew a great event. Airspeed favorite Mike Goulian netted two points with his eighth-place finish in today’s combined qualifying and racing event. Here he is splitting the final gate on the track and pulling her up for a reversal to attack the second half of the flight. Organizers claimed that the event drew 750,000 people total taking in the festivities. 100,000 tickets for viewing areas sold out days before the show. Here’s a shot of the crowd immediately in front of the media vantage point. 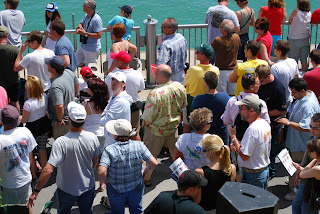 A very cordial crowd that lined the riverfront and packed Hart Plaza and any other place where you could stand, eat, drink, and make merry. No thrown elbows here. Everybody pretty much having a good time. And I have to thank the City of Detroit for having wireless Internet available. My only complaint about the media center was that the wired Internet access apparently had a standard workplace filter on it, which prohibited access to (of all things) Blogger, Twitter, and other services that are pretty necessary to some of us media types, especially the new-media 2.0-ers. At least they didn’t block Libsyn, so I was able to post an episode over the high-speed line. We got the blog post up over the city’s wireless Internet service, but it was a bit intermittent and we couldn’t get pictures up onto the site reliably. 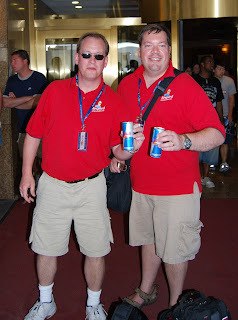 All that said, Red Bull treated Rod and me like kings. Good food, free priority valet parking, shuttles, to important stuff, and, of course, free Red Bull. The wired Internet issue is minor and we got around it handily, if on a limited basis. Way to go, Red Bull! Thanks for the hospitality! 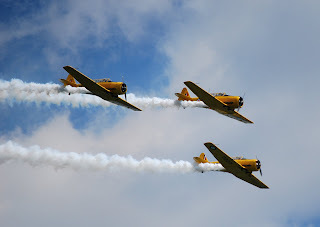 The Canadian Harvards also made an appearance each day, doing a three-ship aerobatic routine. The light was pretty good, too, by the time they flew and I got several really good shots of them. Nice scattered puffy cumulus clouds against which to photograph them. We avoided a major goat rodeo when the valets identified us by our media badges and got our respective vehicles lickety-split. You have to understand that there was perhaps a 30-minute line to get to the valet window to even begin the process of getting your vehicle. Have I mentioned that Red Bull really took care of us? We ran into a group of four people (who apparently also identified us by our media passes), who asked what Airspeed was and, more to the point, could Airspeed get them to Detroit City (Coleman Young) Airport? We allowed as how it (it being Rod) might be able to do just that. I complimented one gentleman on his very nice Cirrus-logo pullover and they shortly indicated that they were all Cirrus folk from the plant in Duluth. How cool is that? A ride to KDET? Let me think about that for two or three seconds. Okay! Rod is working on a social media project involving pilots (the title and other aspects of which I believe are not yet for publication, but about which you’ll likely be hearing soon) and there are worse things that could happen to such a guy as Rod than having a captive audience of Cirrus folk for the 30-minute ride to KDET. Plus, both Rod and I are Cirrus fanboys (see the entries for Airspeed episodes featuring a test flight of a Cirrus SR-22 G3 and my interview with Alan Klapmeier). I would like to have taken one or two, but the thought of Rod with four well-placed and friendly Cirrus personnel in a confined space caused me to hold my tongue and my car keys. He’s on his way back to Chicago this evening. Great to hang out and spend time with him. He was a huge help in gathering background and getting his finger (hand, arm up to the elbow, etc.) on the pulse of the actual competition (as is obvious from the audio of the episode) and he made the whole experience a lot more fun than showing up solo. Thanks, Rod! Come back anytime! I’ll have the Red Bull chilled! One final note: Greg Summers of The Student Pilot Journal called this weekend to say that he completed his private pilot checkride (NORDO, no less!) and is a newly-minted private pilot! Bravo Zulu, Greg!